Our new bulletin editor is Mrs Carol Carlyle. Carol is now collecting items for our spring bulletin. If you would like to make a contribution or place an advertisement, do contact Carol. Subscription forms will be included in the December bulletin. Alternatively, a subscription form can be printed from this website (see membership page). Overseas members can pay their subscriptions via bank transfer. Contact the Secretary or Treasurer for details. 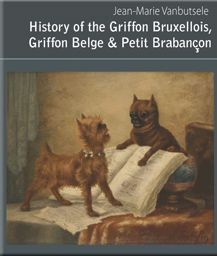 A new breed book has been written by Belgian Breed expert Jean-Marie Vanbutsele. Club member Valerie Brideau from Canada has been involved, along with a colleague with the translation into English and also the printing and distributing of this great little volume. This is a self-published volume and not profit driven. Any profit gained will go directly into further research into the history of the breed. Members subscriptions are due on 1st January 2012. Subscription forms will be included in the December bulletin. Alternatively, a subscription form can be printed from this website. If you wish to be considered for inclusion on the 2012 judging lists, please send your judging CV to the Secretary Mr J Swinge (contact details on the committee page) no later than 18th November 2011. Judges who already appear on the current judges lists should also send any updates to the Secretary. A great day had by all - good weather and food. Lots of Griffons enjoying themselves! Tracey with Chesney won the Photo Competition. The Club would like to thank all its members for making it such an enjoyable day. All members and future members come along and join the fun. A variety of games for our griffon companions hosted by Ian, bring and buy, the fancy dress parade and competition, tasty cold buffet lunch and afternoon tea, bring photos of your dogs for the photo competition. Hope to see you at Worplesdon Memorial Hall, Perry Hill, Worplesdon, Guildford, Surrey GU3 3RF, at around midday.